Retaking historical pictures gives information about changes over long time periods that are sometimes imperceptible otherwise. If you have historical photographs of the SRP, with features in them that will allow them to be retaken today, please let me know. 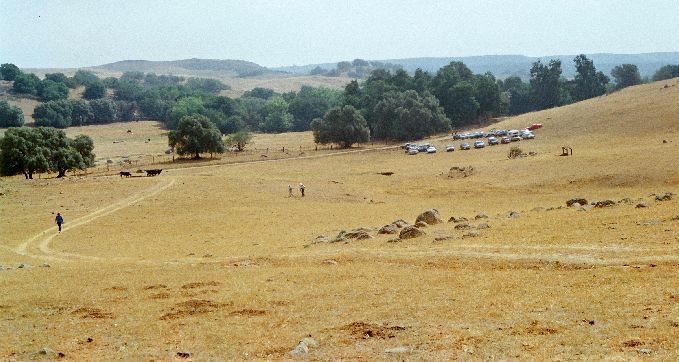 Philip Erdelsky visited the Santa Rosa Plateau on 1 December 1990 on a tour given by the Nature Conservancy. Fortunately, Philip took pictures on his tour that I am attempting to retake. The following is the first attempt to retake a picture of the area including the Adobes and the lowest part of the Vernal Pool Trail. Philip's picture is given first, followed by my picture. You can open the two photographs in separate browser pages and then flip between them, but it won't work very because my picture is clearly not taken at the same spot where Philip stood. The oak tree to the left of the windmill, the pair of oak trees above it, and the windmill itself seem identical in the two pictures. Two rows of trees behind and to the right of the windmill are no longer present. Keith Haworth remembered that these were gigantic pecan trees that were cut down intentionally, since they were invading natural areas. Zach Principe looked at Google Earth historic images, which showed then in 1994, but not in 2002. Zach wrote Pecans and olives were taken out as many seedlings and saplings were being found in the area. There are actually still about 10 small pecan trees in the area west of the windmill. The ridge in the distance immediately behind the oak trees, with Monument Hill in the center, looks exactly the same. Only a few fence posts are visible in the current picture. The trees along the line of fence posts (Ranch Road) in Philip's pix are gone! The cluster of trees around the Adobes seem to be the same or perhaps taller. Until the picture is retaken at the same elevation, it won't be clear if the trees have grown or not. The cluster of rocks closest to the photographer seems identical, as well as the cluster of rocks to its right. The bush in that latter cluster has clearly grown. The leafless willow to the left of the first cluster of rocks is new. The number of oak trees missing today seems very surprising. I wouldn't have expected any big oaks to be missing, let alone seven or more of them. Copyright © 2008-2013 by Tom Chester.